2017 was a mixed bag of marathon and ultra-marathon success and coming up short. I’m not going to use the word “failure” instead I’ll say…”coming up short.” Coming up short of your goals is still a degree of success if you, got to the starting line, dared to dream big and gave it the best you had. I ran 1,959 miles in 2017, I stood on the starting line of 11 race, all 26.2 miles plus and managed my way through three different minor injuries. Not an excuse for coming up short, just some simple facts. I also had an outstanding year! Aside from the running goals, I wanted to get my book “Running to Leadville” out into the world. I wanted to get the story in the hands of runners and non-runners alike to inspire, entertain and to motivate others to live an epic life. At the end of the year I’m overwhelmed by the success. In turn, you have inspired me to keep writing, keep dreaming and to keep running. Thank you. You can pick up a copy on Amazon or a signed copy from my blog. Each 50-mile finisher walked away with a custom finishers award. MARCH: After some down time because of the injury bug, Michele and I were off to the Beach. 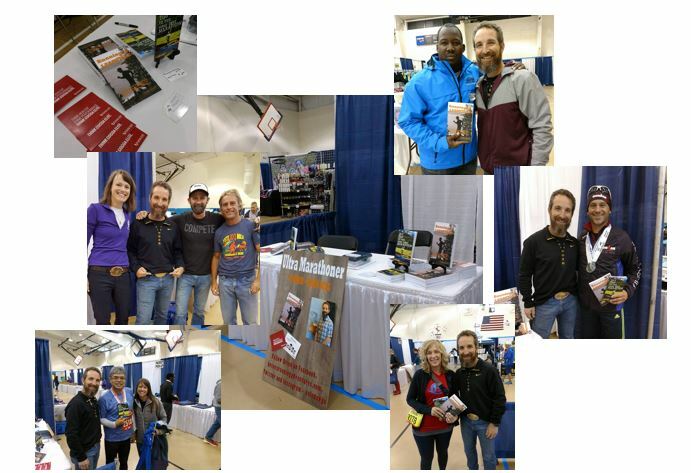 At the Myrtle Beach marathon expo I was able to team up with Shane M. of Roanoke Island Running Company for a “Running to Leadville” book signing. It was a great day hanging with Shane, talking about the race and meeting new friends. Then on a cool morning, with a flat course and some fresh legs I was able to set a new marathon PR (3:53:47). Looking for a spring race that is fast…I would highly suggest you run the Myrtle Beach Marathon, Myrtle Beach, South Carolina. We had such a great time we will be back in 2018….use code BBMBM for a discount on race entry. APRIL: After the marathon success it was time to face the Umstead 100-Mile Endurance Run once again. I ran the first 50-miles with my good friend Eric H. as he took on his first 100-mile race. AND with a ton of help from friends I was able to score a 100-mile PR of 21:36:36. 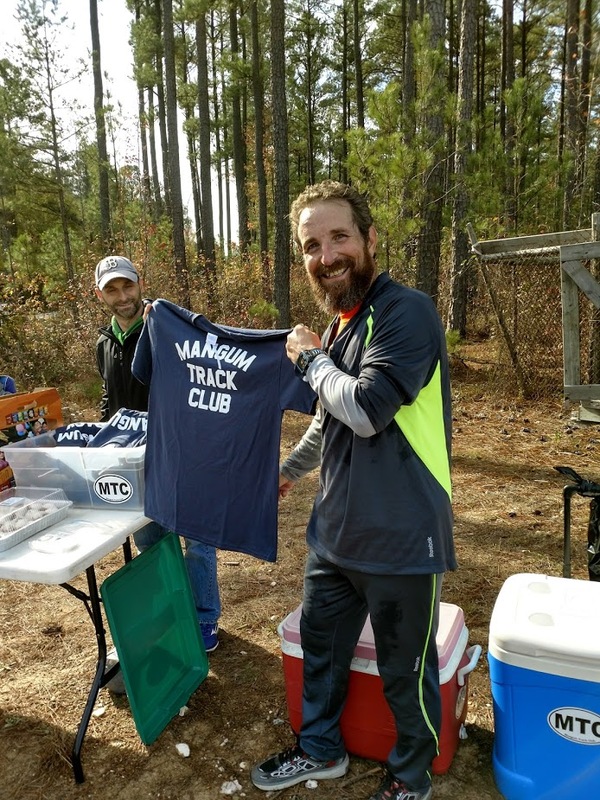 Then it was time to get ready for the annual 24 hour run at Sandy Bottom, in between I joined the Peninsula Track Club in Hampton, VA for a seminar on “How to tackle your first ultra) and Running to Leadville book signing. In my 8 years running this race I thought I had run in every weather condition possible until it got hot….hot, hot….and HOTTER still. Team RUN4LIFE not only did not melt, they melted the course record Virginia 24 Hour Against Cancer, in Newport News, VA. RUN4LIFE took the team Championship for the 3rd time in 4 years with a course record 914 miles. MAY: 2017 only got busier…I took my running shoes on two road trips in May. First linking up with Shane and Heather at Roanoke Island Running Company for a Saturday morning run and Q&A session on tips for “ultra-marathon success” and “Running to Leadville” book signing. The second road trip started with a stop in Fredricksburg, VA where I got to hang out with the wonderful folks of Lucky Road Running store. After a great talk with Jeff and his super customers we traveled to the Cleveland Marathon for a two day book signing at the Expo and a 26.2-mile run along the roads of Cleveland, Ohio. JUNE: The heat of the summer kicked in and it was time to hit the mountains. My friend Josh and I headed to Northern Virginia to run the Eastern Divide 50k, in Pembroke, Va. Great mountain race with tons of climbing and an equal amount of heat. JULY: The summer theme seemed to be “run up a mountain,” when George N. RD of the Virginia 24 Hour Against Cancer talked me into running the Grandfather Mountain Marathon, in Boone, NC. It was hot, hard and well worth it… Summer 2017 would be known for three hot summer races. AUGUST: A local favorite got my goat last year. The 2016 edition of the meltdown saw me DNF’d while running in the lead two-some. This year it was time for some revenge at the MEDOC Mountain Meltdown 50kplus. SEPTEMBER: When you click the registration button on a 100-mile race, it just kind of of lives in the back of your mind haunting you until race morning. Such was the case with the Yeti 100. 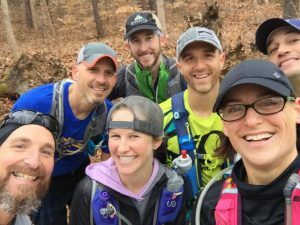 I thought about the race all year… Standing on top of White Top Mountain it was finally time to look for the Yeti and run my second 100-mile race of the year and my 4th 100-mile race overall. The Yeti 100, on the Virginia Creeper Trail, is a great race, and captures trail running at it’s roots. Jason G. and his gang at Yeti Trail Runners put on a great race with some one-of-a-kind flair to keep you moving. At the end of the trail I was so very happy to get a big hug from Mr. Yeti himself and score my very own sub 24-hour belt buckle. That’s four sub-24 hour 100s if your counting…hot dawg. Hot YETI…. OCTOBER: No rest for the Yeti in all of us, road trip time again…Michele and I headed to the 7 Bridges Marathon in Chattanooga, TN. On Saturday we spent the day hanging out at the expo, launching my newest book, 26.2 Tips to run your best MARATHON (or any race for that matter). Sunday, Michele ran the 5k and I took on the 7 bridges challenge….and got an extra .63 mile to boot. The marathon carried a special meaning for me, I ran to honor a little boy who only lived seven days…I ran for Isaiah. NOVEMBER: Regretfully I had to drop out of the City of Oaks Marathon, in Raleigh, NC…this is a great race, but coming off the Yeti 100 and a marathon two weeks later my legs were fried. I needed some lower mileage days to get some zip back in the wheels. Next up would be the Outer Banks Marathon in North Carolina. What a great two days I got to spend in the Outer Banks. I got to spend a cold, and windy Saturday indoors hanging out with good friends, new friends and other Yeti finishers talking about running and pedaling books at the Outer Banks Marathon EXPO Then on a near perfect Sunday, a goal of simply finishing turned into an unexpected sub-four hour marathon performance. November saw another big running accomplishment come off the board. After years of trying, after countless times when my friends got me into the run, only to have life get in the way, I was FINALLY able to join the Mangum Track Club completing the 14+ mile shirt run. What a great day it was…. It won’t be my last shirt run! Over the Thanksgiving holiday I got to run with a great group in Cleveland, Ohio…the Trail Tribe. DECEMBER: As in life everything was going great until it wasn’t. Maybe my favorite 50k, the Seashore 50k, Virginia Beach, Va was my entry into the ultra race world. This year I was going back for my 5th finish and my 5-time finishers belt buckle. UNTIL my left IT band decided it wasn’t the right day to claim my prize. With great regret I dropped out at the half way point. I didn’t get the finish I wanted or the belt buckle…but I did get some awesome pictures. At this point I was trying to keep it all together. I was also disappointed as with this race I was running for something bigger I was running #sidneystrong to support Sidney Povish a 16 year old girl who was diagnosed with (B-All) Lukemia. Her father Brian was one of the four hour marathon pacers who helped me reach my goal at the OBX marathon. Pls help if you can. I hope you had a great 2017 and wish you an outstanding 2018 and beyond. What awesome 2017 running high lite do you have to share with the world…post it in the comments section below. This entry was posted in Uncategorized on January 4, 2018 by burk.brian@yahoo.com. Enjoyed your 2017 recap Brian. Two sub 24 x 100 milers last year (and 4 all time) is really amazing! Awesome 2017 Brian! My highlight was a PR at OBX, 3:55:23, and meeting you.